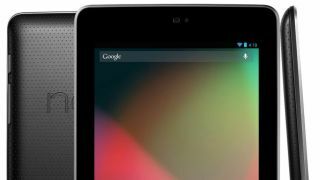 It looks like Google's Nexus 7 tablet is a hit, with sales possibly reaching a phenomenal 8 million by the end of the year. The estimates are based on touch panel shipments, so shouldn't be taken as gospel. Digitimes predicted suppliers will ship 4 million touch panels for the Nexus 7 in the third quarter of the year. Based on this, Tech-Thoughts.net predicts Google will sell 3 million Nexus 7 devices in the third quarter, and between 3 and 5 million in in the fourth quarter. Even if it falls short of this, anywhere near 8 million sales has to be seen as a huge success. Google previously said it hoped to sell 3 million Nexus 7 tablets before the end of the year. Initially, Google struggled to meet demand, with the entry-level version of the tablet selling out. But now it's back in stock, with an estimated shipping time of three to five business days. The Nexus 7 has won plaudits across the board, for its great build quality and amazingly low price of just £159 for an Android tablet. Many think Apple will announce an iPad mini to compete with Google's 7-inch tablet. Asus partnered with Google to produce the Nexus 7 in just four months, when usually the design cycle of a product like this is between six and 12 months. Some early adopters complained the Nexus 7 leaked light from the side of its screen, but Google has since fixed this.